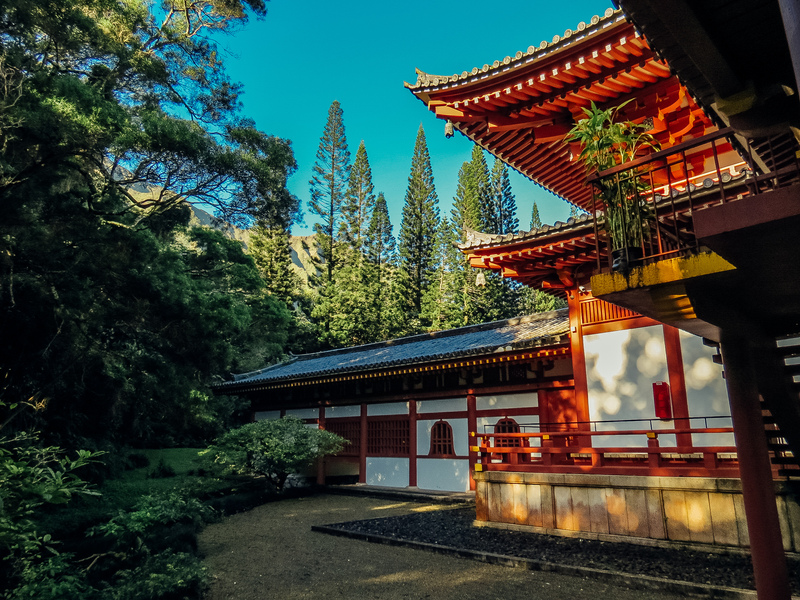 On our agenda for today was a visit to the Byodo-In temple in the town of Kaneohe, on the eastern side of Oahu. After encountering lots of traffic on the North Shore yesterday, we figured we’d get an early start so that we can get to the temple shortly after it opens at 8:30 am. The drive from Wahiawa was beautiful! We got to cross the Ko’olau mountains and popped out on the other side to see the sprawling Kaneohe bay in front of us. 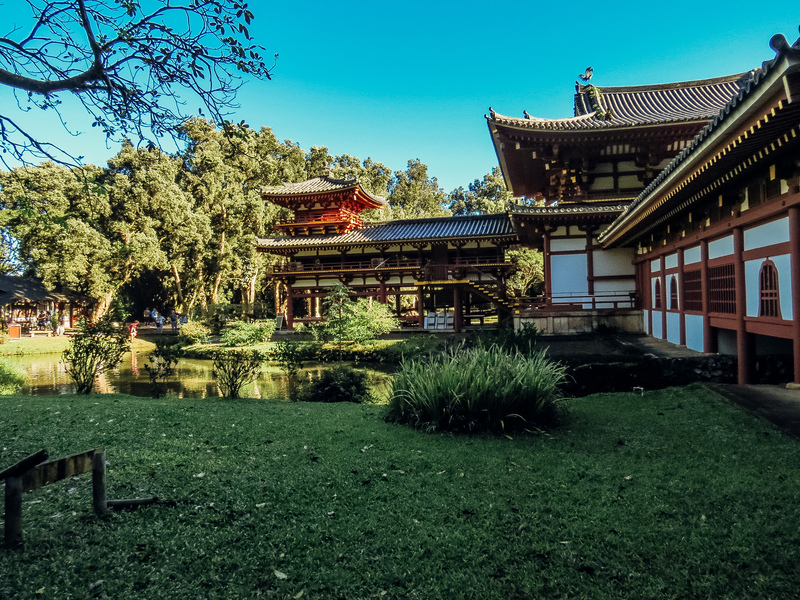 The Byodo-in Temple on Oahu is a half-sized replica of a 900-year old Buddhist temple of the same name near Kyoto, Japan. 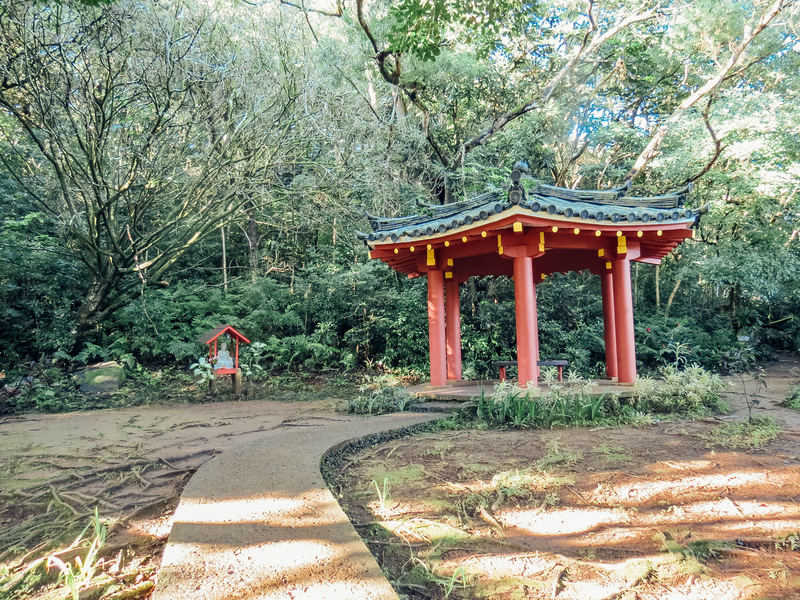 It was dedicated in 1968 to commemorate the 100-year anniversary of the first Japenese immigrants to Hawaii, which came to work on pineapple and sugarcane plantations. It is not a functioning Buddhist temple as it does not have a congregation or a resident monastic community. 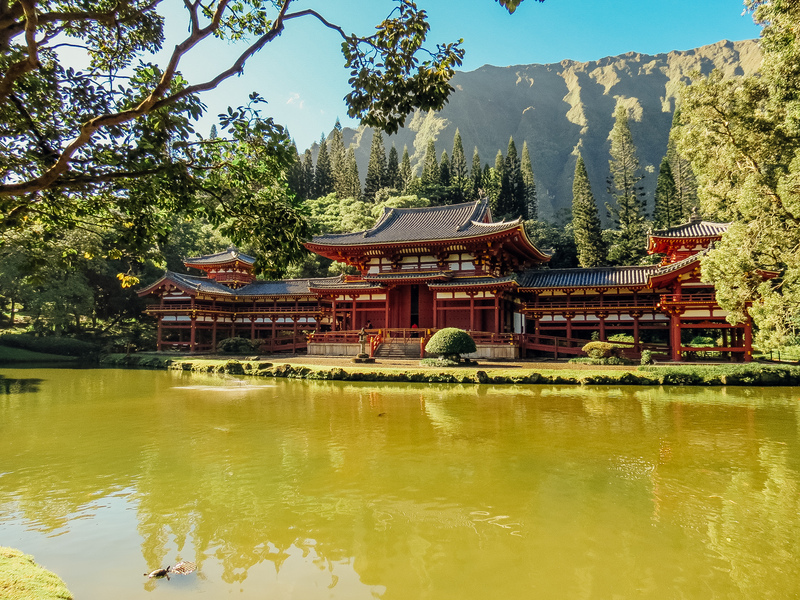 The temple is located in the Valley of the Temples Memorial Park, which is nestled in the foothills of the Ko’olau mountains we had just crossed. We got our first views of the temple as we paid the entrance fee and crossed over the small bridge that leads onto the grounds. The light was perfect as the temple faces east. One of the first things we noticed was the sacred bell. It was cast in Osaka, Japan, It weighs 3 tons and is 5 feet high. 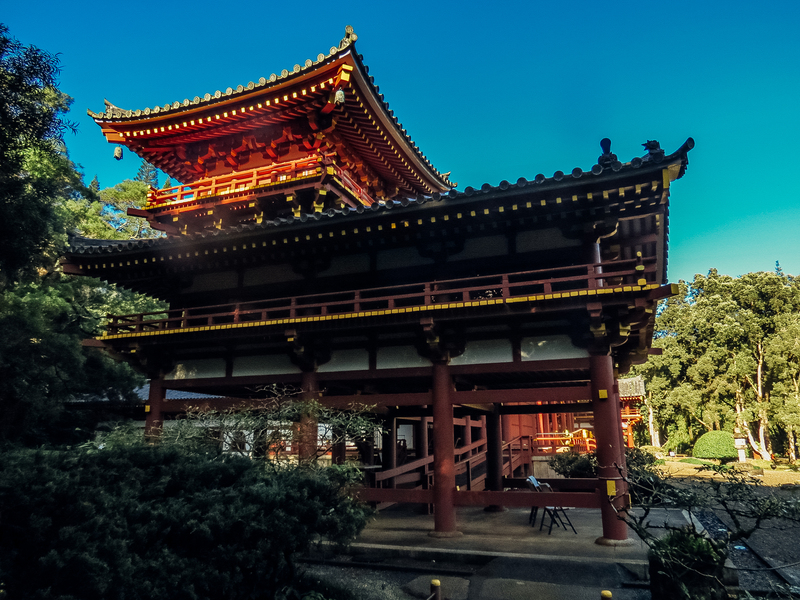 It closely resembles the bell at the original temple, which is over 900 years old. A wooden log is used to strike the bell like I am doing in the video below. The sound of the bell cleanses the mind creates a sense of tranquility for meditation. But where do you meditate, you might ask? Just a little ways up the path before entering the temple we found a meditation pavilion. I was fascinated by the architecture. From every angle, the temple was so intricate and gorgeous! 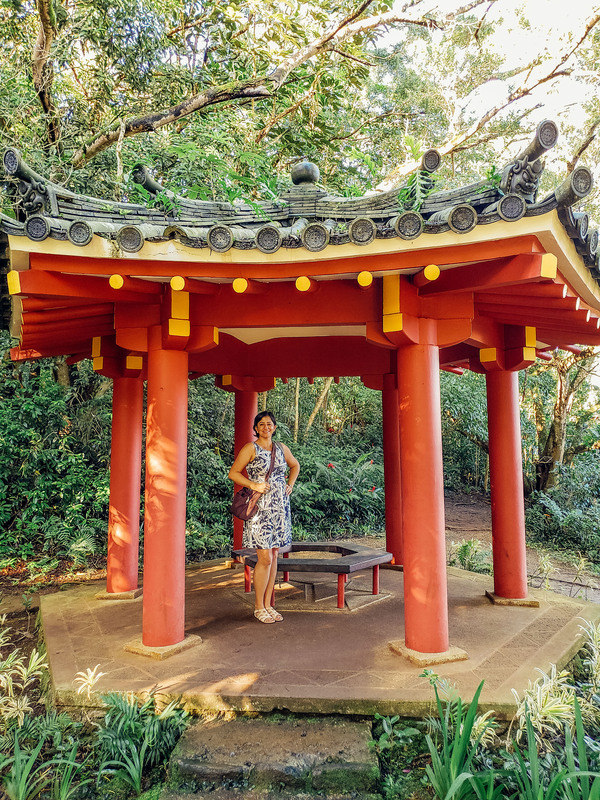 Once we were done walking around and taking in the peaceful atmosphere, we decided to head north along the east coast of the island toward Turtle Bay resort on the North Shore. More beaches were before us. I am not sure how long it would take one to visit all the beaches on this island, but I imagine it would be quite a few years. As we were driving, I spotted an islet in the bay called Mokoli’i, although everyone here (and guidebooks) use the more common name Chinaman’s Hat. A good way to see it is to stop at Kualoa beach park, although the view from the road as you’re driving is pretty good, too. 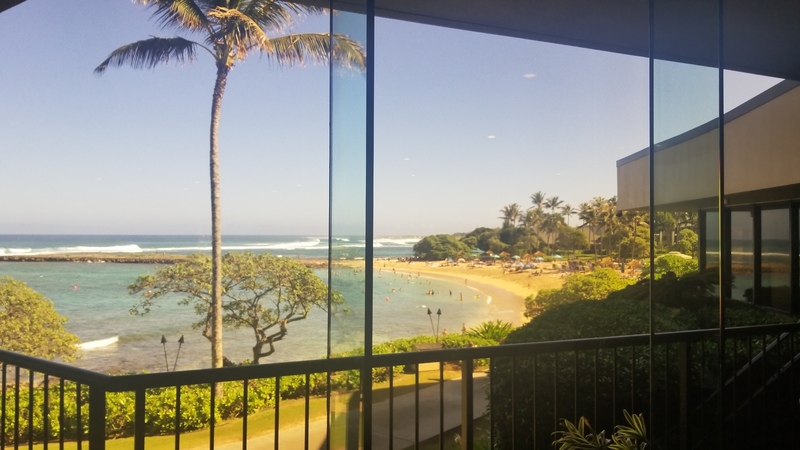 We got to Turtle Bay resort around 11:30 am. 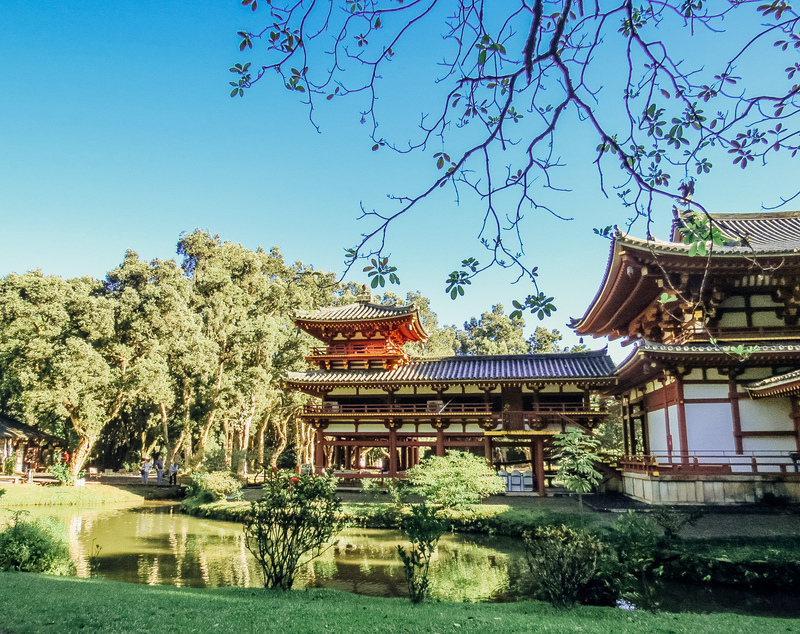 It’s a full hour’s drive from Byodo In, more if you stop along the way. I wanted to visit this resort because it’s featured in the well-known movie Forgetting Sarah Marshall. The lobby did not look nearly as fancy as it did in the movie – at first, I almost thought I didn’t have the right spot. Turtle Bay is nice but it’s been around for a while and it’s a little dated. 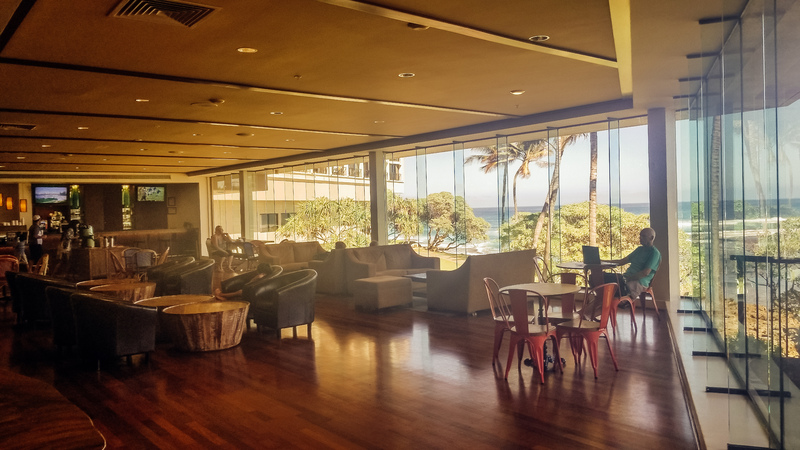 It’s the only big development on the North Shore, and locals want to keep it like that. As we were driving up here, we saw a few signs along the road to that effect. The locals have learned their lesson from the over-development in Waikiki, the famous neighborhood in Honolulu. We sat down at the resort restaurant for a drink and a light lunch. We enjoyed people watching and listening to the waves. We drove back to Wahiawa, seeing the same gnarly traffic in the opposite direction as the day before. Whew! We spent a few more hours with Vanya, then drove down to Waikiki, where we were staying for the rest of our time on Oahu.